Edith Joaquin is the pen-name of Georgette Gonzales. 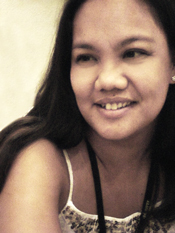 She writes romance novels in Filipino and has a total of 16 books in publication with 11 yet to be released under Bookware Publishing Inc. You can find out more about Edith in her Facebook page. 1. You mostly write love stories. Where do you get your inspiration? I have a favorite quote from Neil Gaiman: You get ideas from daydreaming. You get ideas from being bored. You get ideas all the time. The only difference between writers and other people is we notice when we’re doing it.I believe this is true. Inspiration comes from watching movies or reading other books, or little bits and pieces you witness from everyday living. Before I go on, I wish to clarify—I write romance. All happy ever afters, all having that “I wanna live that kind of life and be like her and have that kind of guy in my life” kind of stories. Love stories are different—it may not always be a happy ever after. So technically, all romance stories are love stories but not all love stories are romance stories. 2. What other themes have you touched on? Anyway, I haven’t touched on any other central plot other than romance but I do flavor my work with mostly action-packed scenes. I’m so into military or men with guns. Hahahahaha!!! Seriously, I think about 15 of my books (including those that are yet for release) have running, car chases, gun fights, hostage situations, stuff like that. 3. How has your writing evolved through the years? What are some challenges you faced? Before I went into romance novel writing, my expertise lay in publicity writing. Too technical to be literary. Although I do write poetry my biggest challenge was coming up with a plot that could fill up 96 pages of roughly 20,000 words that would be interesting enough for a potential reader to finish and feel that i didn’t rip them off of their (now) $0.70 because I wrote crap. That’s the same challenge every time i write a book. I work hard at coming up with scenes because my nightmare is for my work to sound all alike. 4. Among all the books you’ve written, which one is your favorite? My favorite is the one titled ‘Safe In Your Arms’, my first novel with a soldier for a hero. It was because of this that i got into military romance. Before I wrote this story, I sort of had no heart for the military or the men in force. After writing this, I managed to develop some sort of fascination for the military, for what they do, how they are able to do it. Hmm, the truth is there’s a part in the novel where I wanted to revolt haha. Both parties almost fell in love with someone else! I was like, noooo! The laws of romance pocketbooks are as indomitable as the laws of physics. This can’t be! Kyle and Ina are the protagonists! They can’t fall in love with someone else! Hehe, forgive me, I get this affected when reading. I like the pacing and storytelling. Bit and pieces are revealed at the right moment, creating a very good atmosphere of suspense. In my experience, that’s quite a challenge—when to reveal details as to not confuse the reader and retain the element of surprise and anticipation. That’s what I like about this book. 5. Even if your background is writing in English, why did you choose to write in your native language (Filipino)? I went into novel writing out of need. I needed extra money while not having to resign from my job (I was still with PETA at the time) and writing Tagalog (Filipino) romance was the easiest means to get into literary (or something close to literary although this genre is also pop lit) writing. Besides, yes, my background writing was always English but I do consider myself bilingual so it wasn’t really difficult for me to shift. 6. What tips do you have for the aspiring romance novelist? First and foremost, READ!!! Read, read, read and read some more. Don’t worry too much about what to do, where to go, just get it done. Things will materialize if it’s for you. One more thing, don’t expect mentors to teach you everything. You can’t learn everything from them. other than technicalities, your style is something you develop on your own. Live and work for your dream, if that dream is writing. But then you also have to recognize if that dream is really for you. Maybe a dream will have to remain a dream because, in real life, there’s something else meant for you to do.